After two years of saying I was going to put up some shelves, I’ve finally done it and am so happy with the results! These shelves were in my master closet when I moved. After trying a few things, I couldn’t find any functional use for them so I removed them. You can see the wall the shelves came from in my post about patching the holes the shelves left behind. Since then, I’ve put a shoe rack in place of the shelves and I hung my necklaces about eye level above the shoe rack. Before putting up the shelves, I bought a few extra mounting brackets and screws to replace ones that were damaged during removal. Other than the couple of dollars spent to get the extra parts, the shelves are 100% up-cycled. I chose to mount the shelves right by my door to the house for convenience. I also bought bins from the dollar store to hold my painting supplies, gardening tools, and other yard and outdoor supplies. The four shelves fill up the wall perfectly and I even have enough room to fit my lawn mower underneath. What are some things you’ve up-cycled? My garage is an unorganized mess right now. I really need to do this, like yesterday! Thanks for the great tip! I need to put shelving up in my garage. I feel like it’s always messy! I love the way that looks! I have some similar shelves in my garage, but everything just gets crammed on there and it looks awful. Those colorful baskets are a perfect solution! 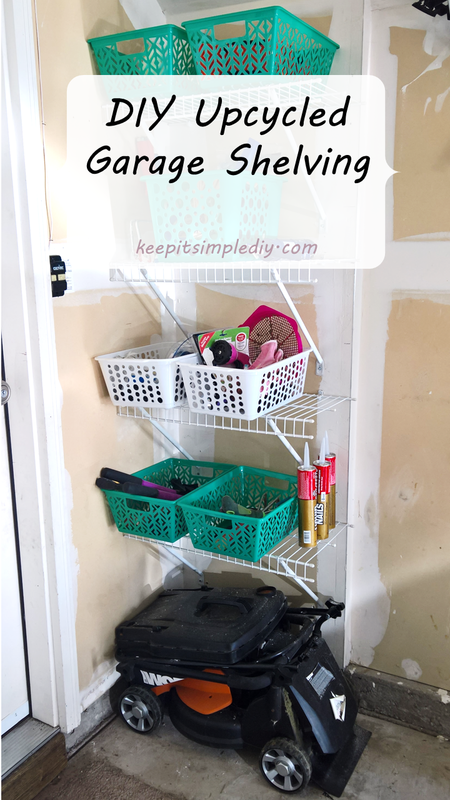 It always feels good to find a new use for an old item … this was a great way to use those closet shelves! I’ll bet you find all kinds of things to store on them now. i really need to get my garage organized! This would be a great start! Adding shelving in our garage was the best thing we did!